An incredible new indoor shooting game. 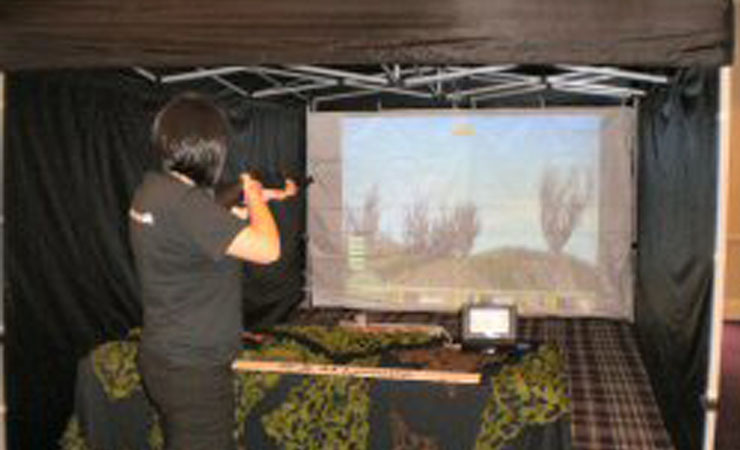 Projected on to a large screen at least 15 games may be played on this exciting game of skill using a choice of pistol or rifle. Duck shoot, clay shooting and prairie dog shooting are just three of the games available. Moving targets are projected on to the screen; the camera picks up your accuracy and automatically determines your scores. The system is supplied with a surround sound system and trained operators to instruct and operate the system for the duration of your event. Soon to be introduced……a dedicated Inflatable shelter suitable for outdoor use!